Why is Trump parroting Saudi Arabia’s lines on Jamal Khashoggi even before they do? Remember folks, spreading conspiracy theories is bad. 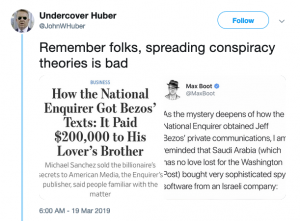 A 9 tweet thread on Saudi conspiracy against Bezos. Iran and Russia have an interest in toppling the House of Saud. That headline question may seem premature, but it’s worth asking if only to reduce the odds that the Saudis are lost as we enter the last perilous year of the Obama Presidency. Iran and Russia have an interest in toppling the House of Saud, and they may be calculating whether President Obama would do anything to stop them. This comes to mind watching the furious reaction by Iran and its allies to Saudi Arabia’s New Year execution of 47 men for terrorism. Most of the condemned were Sunnis, including members of al Qaeda, but the Saudis also executed prominent Shiite cleric Nemer al-Nemer, who had led a Shiite uprising in 2011. Iran already has ample reason to want to topple the Saudis, who are its main antagonist in the Shiite vs. Sunni conflict that has swept the region amid America’s retreat. The two are fighting a proxy war in Yemen, after a Saudi-led coalition intervened to stop a takeover by Iran’s Houthi allies. The Saudis are also the leading supporter of the non-Islamic State Sunnis who are fighting Syria’s ally Bashar Assad. Russia and Iran are allied with Assad. Then there’s Saudi oil production keeping oil prices low. As the biggest exporters in OPEC, the Saudis have refused to cut production to stem a supply glut that has cut prices to $37 a barrel. This means Iran will get much less benefit from its renewed ability to export oil under its nuclear accord with Mr. Obama. Saudi exports are also punishing Russia, the world’s second largest oil producer, which by some accounts needs oil at $100 a barrel to satisfy Vladimir Putin’s domestic promises. The ruble dropped to its lowest level to the dollar in 2015 last week on the prospect of still-lower oil prices. Russia and Iran would benefit greatly from internal Saudi turmoil or the threat of a larger regional war that caused oil prices to spike. None of this means a direct Iran-Saudi conflict is imminent, though with dictatorships you never know. Iran had no good reason to fire rockets within 1,500 yards of the USS Truman last month, but it may have been testing to see how the U.S. would react. The Administration didn’t respond until the news was leaked, and then with a mild military statement. The White House decision last week to walk back U.S. sanctions against Iran after its recent ballistic-missile tests may also embolden Iran to take greater risks. Iran’s leaders may believe the nuclear deal is a greater restraint on the U.S. than on their own regional ambitions. They can always threaten to leave the nuclear deal if the U.S. imposes new sanctions. The Revolutionary Guard may also believe they have more freedom of action given Russia’s support in Syria and its plan to deliver S-300 anti-aircraft missiles. As for the Saudis, they can be forgiven for doubting that they can count on President Obama. Fairly or not, they concluded from the fall of Egypt’s Hosni Mubarak that this Administration will abandon its friends in a pinch. They saw his “red-line” reversal in 2013 in Syria, Mr. Obama’s accommodation to Russian revanchism in Crimea, and that he now may let Assad keep power in Syria. The Saudis intervened in Bahrain in 2011 without telling the U.S., and they recently formed a new Sunni-state coalition to fight Islamic State—again without the U.S. The Saudis are often difficult allies, especially the support by rich Wahhabi sheikhs for radical Islamist mosques and schools around the world. But in a Middle East wracked by civil wars, political upheaval and Iranian imperialism, the Saudis are the best friend we have in the Arabian peninsula. The U.S. should make clear to Iran and Russia that it will defend the Kingdom from Iranian attempts to destabilize or invade.